Iogo, a brand of dairy products, including yogurt, is inviting you to take part in their Spin the Bottle Nomad contest. The contest located on Iogo.ca/Nomad is running through October 31, 2014. There are $10,000 in prizes: 3 grand prizes of $1,000 each and 110 instant prizes. First, you need to have bought a Iogo product to get the unique code. As part of the “Spin the Bottle” contest, all 200 ml, 300 ml, and 12 x 200 ml IÖGO Nomad products with a best-before date between September 29, 2014 and December 14, 2014, are eligible. Second, you have to have a valid Facebook account. Who doesn't these days? 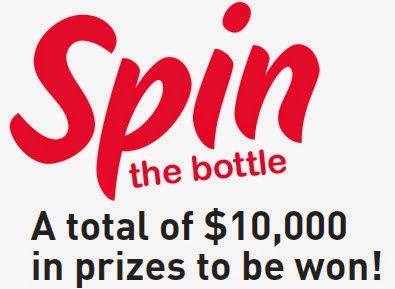 c) If you have a Unique Code, enter the instant prize portion by clicking on “I want to play spin the bottle”. Hopefully, you will get one of the 110 instant prizes. - Fifteen (15) gift cards for a shopping trip valid in one of Cadillac Fairview’s shopping centres (approximate value of $250 each). Given the multitude of prizes, it's worthwhile taking part in the contest.